What’s next for P.I. food writers? See that redhead on the left? Does she look familiar? No? Well, say hello to Leslie Kelly. Until today, you knew her as the P.I.’s whining and dining restaurant critic. 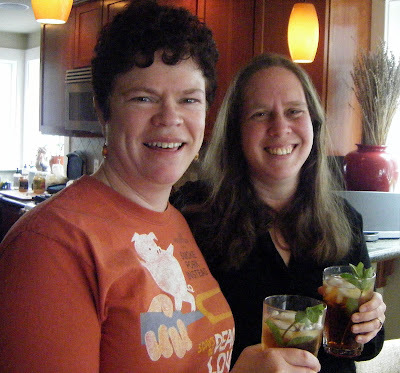 On the right is Rebekah Denn, who kept abreast of the local food scene via her Wednesday food column and her P.I. blog, Devouring sEATle. That was some strong sweet tea they were drinking, and today I raise a glass of something even stronger to those longtime journalists as they head out into the great big world of, well, let me let them tell you. Here’s Leslie’s big news. And here’s Rebekah’s plan. In addition to being my colleagues, they’re also my friends, and as such I wish them great success. That wish also goes out to everyone at the P.I. — where I got my start writing reviews for a big metro daily before the Seattle Times came calling. Yes, it’s a mad, mad, mad world out there in newspaperland, as you can read here, here and here . Meanwhile, stay tuned to All You Can Eat and the Seattle Times where, beginning this week we’ll be bringing more food coverage to the table both in print and online. And do me a big favor: If there’s something you’d like to see more (or less) of, food-and-drink-wise — here on the blog or elsewhere at the Times — consider me your advocate. I can’t promise the moon, but I can promise some stars (the P.I.’s loss of Lynne Rossetto Kasper’s recipes from “The Splendid Table” is the Seattle Times’ gain). And when it comes to walking into the big boss’s office with my hands on my hips and your word on my lips, trust me: I’ve never been shy.